Who Are You Going to Call? OC Paintless Dent Company! Orange County Paintless Dent Company has been servicing Orlando and the outlying areas including Seminole County since 2008. While our name reflects the fact that we are based out of Orange County, we offer a mobile dent removal service and we enjoy the ride to Seminole County so don’t hesitate to give us a call next time you are looking for a reliable paintless dent repair company! 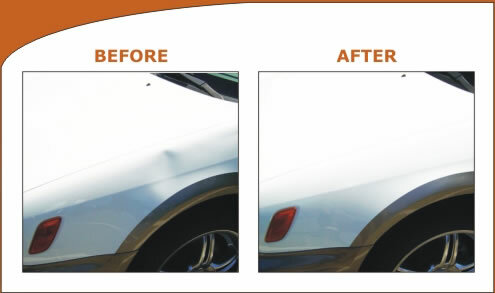 Our experience in the paintless dent removal industry dates back to 1996, which means you can be confident that you will get superior service with the highest caliber repairs. Having worked and lived in the area since 1982, we truly love being part of this business community. We look forward to the years of providing friendly, cost effective and convenient dent repair services in Seminole County that are ahead of us. Seminole County can get some wild weather and unfortunately sometimes that weather can cause damage to your automobile. The dents and dings that result from any number of causes don’t have to be repaired at a bodyshop, in fact a lot of storm damage can be fixed with the paintless dent removal process we use. Often times, even severe damage can be fixed without having to get a new paint job, wouldn’t that save you a bundle? We fix damage on all makes and models of automobiles, including foreign and domestic. View our FAQ page. Not sure if paintless dent removal will work for your dent? Call 407-924-2507 or contact us online for a free estimate or to schedule a repair for your vehicle. We are a licensed and insured Seminole County dent repair service! Our dent repair in Seminole County incorporates retail customers, dealerships, wholesalers, body shops, detail shops, company fleets, and rental car agencies.